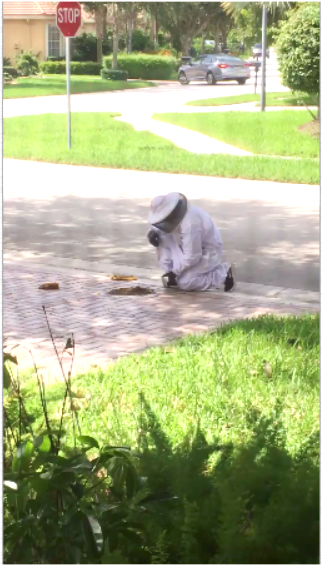 Submitted by Mr. and Mrs. W.
WHAT OUR NETWORX CONTRACTOR DID FOR US: Emergency bee removal. WHY WE CHOSE HIM: Immediate response. 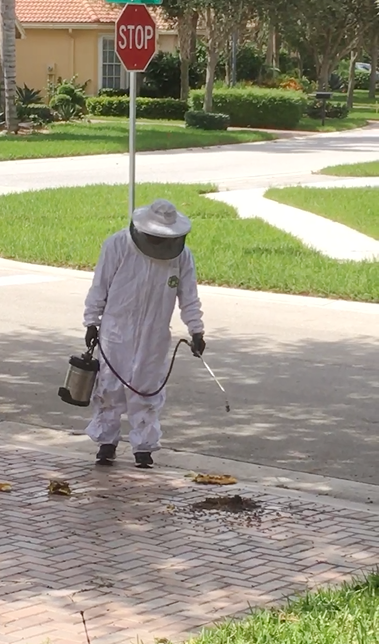 Our driveway was literally swarming with bees. There was no way we could get to our car. In fact, we were afraid to leave our house. Where did the bees come from? We blame Hurricane Matthew, which recently hit our home state of Florida. We can only assume that a hive blew from a tree somewhere and splattered on our driveway. In a panic, I called a local pest control company … but they said they don’t remove bees! They only spray trees and indoors. So I went on google and searched for “bee removal.” I connected to Networx and within 5 minutes they emailed me numbers of 3 bee removal people in the area. The first one on the list, Ambassador Pest Management, was the one we hired, because he said he could come out right the next morning. He checked around the rest of the area to see if there were any other beehives. Something terrific: when he saw this big turtle not far away from us (I saw it too), he removed it so he wouldn’t get any spray on him – or her. He put the turtle in his card to drive it to a pond somewhere. That was really nice of him, I thought, so I became his buddy right away. The actual spraying took about 6 minutes. (The photos you see were taken through our window screen, from safe inside the house.) Then he swept up the dead bees and took them away. We’d definitely recommend him to others and will use him again if necessary. He was a really good guy and did a great job getting rid of the bees. Advice from the Mrs.: Look for a contractor on google. It was the best thing for us because we learned a lot about bees and found Networx, which was wonderful because it really was fast. A good Yelp review is also helpful. Advice from the Mr.: What I would do is look for recommendations from people like me describing exactly what he did and how he handled everything. Customer testimonials are very important to new homeowners – or anybody. Ambassador Pest Management Barbara wool: Perfect results! No more bees!!!! Mouse Control Included Traps and Exclusion by Ruby S.
Hardworking Handyman Service Helped Us Settle in our New Home by Gisele G.
Garage Roof Leak Repair Means No More Dripping Onto My Drywall by Pamela H.